Summary : High Voltage Engineering shipped the first commercial Ion Implanter, built in 1965 by Peter Rose. High Voltage Engineering shipped the first commercial Ion Implanter, built in 1965 by Peter Rose. 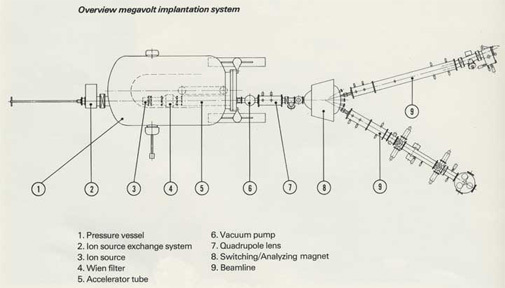 But it was not a Megavolt System such as depicted here. That took almost two more decades and a lot of research. Through it all, the company went on to establish practically the earliest true megavolt systems in the 1 and 2 MEV range. For several more years it remained the main source of these tools, which were to become critical for producing buried layers. Many of these systems were placed in the field but the division failed as a business, possibly aided by the conservative eastern style business model of its parent. Key Contributors: To Be Recognized. The tool that sparked the yield management revolution.